If you have multiple W2W usernames, (ex. you have an employee and a manager login, or employee logins on different accounts), you can create a "Switch List" that will help you quickly switch between your usernames. You can add as many usernames as you like to your list which will then appear in the top menu as a lightning bolt in the upper right instead of "Sign Out." The username you are logged in with when you create the Switch List will become your main "power username" and by logging in there you can quickly switch to your other usernames without needing to log in again. 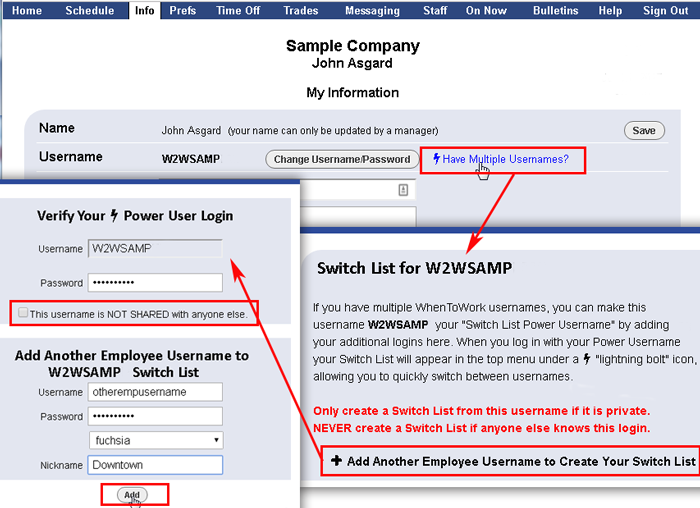 If you have an employee and a manager login, create the Switch List under your manager username. Employees cannot add manager usernames to their Switch List. Note the Switch List should only be added to a username that it totally private and one that is never shared with anyone else. You will then see a window showing you your Switch List where you can edit the color and nickname if needed. Now your top menu will show a lightning bolt in the upper right. Click the icon to view options to Sign Out of all or to toggle between viewing your other username or add/edit usernames. Note you can hold down the Shift key and click the other nickname in the top menu to open the other username in a different window, so you can view side by side.